With the addition of new and more powerful smart home devices, we’re at risk of overloading our Wi-Fi networks. As more and more traditionally “dumb” products are incorporated into the Internet of Things (IoT), public interest in smart-home technology will continue to grow. 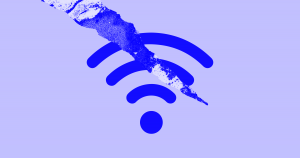 But as the list of internet-connected devices expands, so too does the potential to overload our home Wi-Fi networks. Being able to control various aspects of your home with the push of a button (or the sound of your voice) might make it feel as if the sci-fi future we were promised as children has finally arrived. But if our Wi-Fi networks can’t keep up with demand, that feeling will be very short lived. Luckily, there are several ways you can create a futuristic smart-home without overburdening your Wi-Fi network. Meet Zigbee, Bluetooth Low Energy, and Z-Wave, three Wi-Fi alternatives for running a wireless smart home network. Let’s take a look at their pros and cons, and a few of the many compatible smart home devices than can be used with each. It’s possible you’ve never heard of the wireless communication standard known as Zigbee. However, chances are you’re familiar with some of the products that rely on it. Specifically, the widely popular Philips Hue smart-lighting system uses Zigbee to ensure its various devices are able to communicate with each other. Philips Hue Beyond Dimmable LED Smart Pendant Light combines scene-setting mood lighting and warm white task lighting. Philips White Ambiance Dimmable Smart Suspension Light lets you wirelessly set the perfect setting for any mood or activity. The Yale Assure Lock Touchscreen Deadbolt allows you to lock and unlock your home with ease from the backlit touchscreen keypad. However, as with most things in life, there is a tradeoff. For starters, both Zigbee and Wi-Fi channels operate in the 2.4 GHz band, which means there is a potential for interference. While there are steps that can be taken to avoid this, they’ll involve some technical know-how. Also, since Zigbee products don’t operate off of Wi-Fi (which is the whole point, of course), Wi-Fi-enabled devices (phones, laptops, Alexa) can’t directly communicate with Zigbee products without using a bridge or hub. However, there are several products available for purchase that can solve this problem. The latest Samsung SmartThings Hub allows you to control a wide range of smart devices from various brands and protocol types. Wink Hub 2 lets you wirelessly manage hundreds of smart products from the best brands with one simple, easy to use app. Philips Hue Bridge allows you to control up to 50 different Philips Hue lights from home or when on the go with its easy-to-use smartphone app. Another alternative to Wi-Fi for your smart-home is Bluetooth Low Energy (BLE). Originally known as Bluetooth 4.0 and Bluetooth Smart, this wireless communication system differs from its predecessors in several ways. However, the most obvious difference is BLE’s efficiency. Devices utilizing it can run for several years off of a single battery, making it an ideal candidate for certain smart home products such as door locks and sensors. And unlike Zigbee, BLE connects directly (peer-to-peer) with other BLE enabled devices so you won’t need a hub. The Elgato Eve Room Indoor Sensor monitors indoor air quality, temperature, and humidity while analyzing volatile organic compounds (VOC). Eve Door & Window sensors keep track of whether your doors and windows are open or closed, allowing you to keep a closer eye on home security. On the down side, while BLE devices can connect peer-to-peer without the use of a hub, it can be difficult to connect with multiple devices at the same time, or to control remotely via the internet. Another con of using BLE is that it is relatively limited in range compared to its competitors. Where as Wi-Fi, Zigbee, and other options will often provide coverage for an average-sized home, BLE has a range of only a few meters. That said, depending on how you are using BLE, this might not be an issue. For example, a few meters of range is more than enough for a smart lock that pairs with your phone. Also, updated versions of BLE are implementing mesh-network technology, which may eliminate the issue of limited range in the near future. The Ultraloq UL3 BT smart lever lock lets you use fingerprint, code, key, or smartphone to unlock your door. Last but not least, we have the Z-Wave protocol, which is similar to Zigbee in many respects, but with a few key differences. Like Zigbee, Z-Wave won’t put a strain on your Wi-Fi network, but requires a hub to be controlled by Wi-Fi-connected devices. However, unlike Zigbee, Z-Wave runs on a 918/960 MHz band, which means the chance of it interfering with your Wi-Fi network is extremely minimal. There are several other factors working in Z-Wave’s favor. Where as Zigbee has a range of around 30 to 60 feet, Z-Wave can reach distances of 100 feet, making it a better option for larger spaces. Another issue is standardization. Z-Wave works off of a unified standard, meaning all Z-Wave products will work together. Zigbee does not demand the same strict controls, so not all of its devices are compatible. The GoControl/Linear GD00Z-4 Garage Door Opener Remote Controller adds Z-Wave functionality to your existing garage door. With Piper nv’s day/night HD camera, you can see, hear, and know exactly what’s happening in your home or office from anywhere in the world. While the unified standard found in Z-Wave devices is a benefit, it has also proven problematic in at least one respect: consumer options. By holding Z-Wave products to a higher standard, at least as far as compatibility was concerned, Z-Wave’s creators made the network less attractive to third-party developers. As a result, there are far more products currently available for Zigbee than for Z-Wave. But as the products listed above and below demonstrate, there are still numerous Z-Wave options, with new products being rolled out on a regular basis. The Radio Thermostat Ct32 replaces your standard low voltage thermostat and can be controlled by a Z-Wave controller. The Kwikset SmartCode 910 allows you to lock or unlock your door from anywhere with a supporting Z-Wave smart home system. The GE Z-Wave Plus Smart Lighting Control Light Switch lets you control your lights from anywhere. Each Wi-Fi alternative mentioned above has its own benefits and drawbacks, which makes choosing between them difficult. Luckily, thanks to open source hubs like Home Assistant and openHab, which can run off your own home server or Raspberry Pi, you don’t have to. Because these hubs were developed by a community of users, they aren’t beholden to any one company or protocol, and allow you to seamlessly integrate smart home devices that might otherwise be incompatible. And while some of the commercially-available hubs mentioned above also allow this, to a certain extent, they don’t offer the same level of freedom and customization that these open source hubs provide. Home Assistant is powered by a worldwide community of tinkerers and DIY enthusiasts who value local control and privacy. openHAB supports more than 200 different technologies and systems, along with thousands of devices which can be accessed from anywhere. That said, as with most open-source projects, a certain degree of technical knowhow is required, which makes Home Assistant and openHab more suited for tech-savvy, DIY-inclined users. So if you don’t fall into that category, you’re probably better off sticking with an off-the-shelf hub.